The official name of our church body is the "Christian Church (Disciples of Christ)." 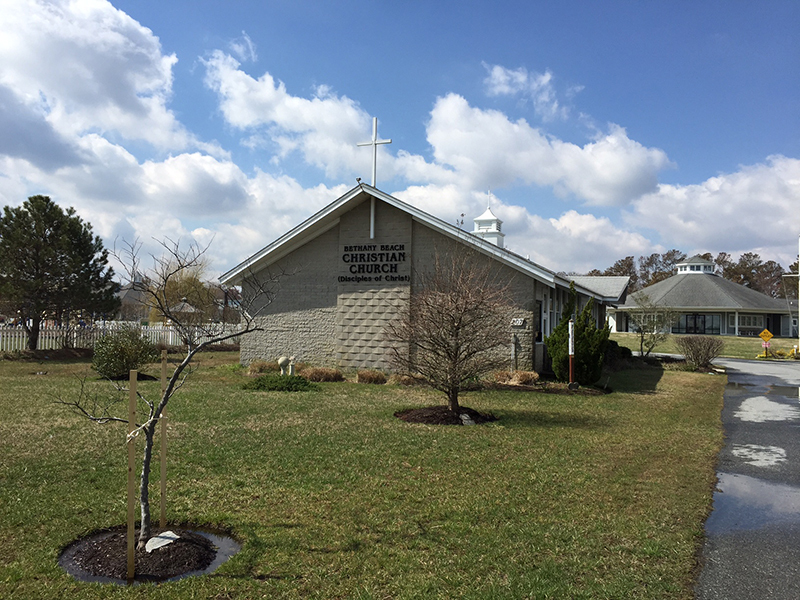 Individual churches such as Bethany Beach Christian Church (Disciples of Christ) are referred to as congregations of the Christian Church (Disciples of Christ), which currently has approximately 455,300 members in the United States and Canada, and is involved in mission work throughout the world. Our history begins almost 200 years ago on the American frontier, when many people from different cultural and church backgrounds were thrown together for our great country. Though Christians in the New World felt united by their common faith, many frustrating denominational differences, much sharper than those felt today, kept them apart. Out of that frustration grew a movement for Christian unity. There were three main leaders of the movement: Thomas Campbell, Alexander Campbell, and Barton W. Stone. Thomas Campbell, a Presbyterian minister, immigrated to America from Ireland in 1807. Disturbed by the infighting within his own denomination in Ireland and Scotland, he came to America, where he found the situation equally bad. Soon after his arrival, he was asked to preside over a worship service in which rival factions of Presbyterians were present. As they came to the Lord’s Table, Campbell invited all present to join in communion. Because of their disagreements, the groups were not supposed to share in communion. Consequently, Campbell was summoned before his governing presbytery, and for his action, suspended from the ministry. Suspension galvanized him into an effort to bring Christians together beyond the sectarian divisions that tore them apart. Soon Thomas’ son, Alexander, emigrated from Scotland to join his father in the work. The Campbells and those following them did not want to create a new denomination or add to the divisive names already in existence. Therefore, they called themselves only "disciples" or "disciples of Christ." These leaders then made the decision to break down sectarian walls by rejecting the individual traditions and creeds of all denominations. Their goal was to return to the Bible and the practices of the earliest Christians, as described in the New Testament. Their search of scripture led them to conclude that in the early church, communion was shared each Sunday and baptism was by immersion. The third leader in the early 1800s was another Presbyterian minister by the name of Barton W. Stone. Stone was born in Maryland in 1772 and educated in a Presbyterian college. There he accepted the Christian faith and began to preach in Presbyterian churches. After accepting an official call to serve two Kentucky congregations, Stone was required to seek ordination. This required affirmation of the doctrines taught in the Presbyterian "Confession of Faith." In studying the doctrines, Stone found that he could not fully accept their content. As a result, he told his superiors that he could only accept the confession insofar as he saw it consistent with the teachings of the Bible. They accepted his response and ordained him to the ministry. As time went on, however, Stone became increasingly concerned about the various doctrines in the Confession of Faith. Finally he left the Presbyterian Church, seeking to be only "a Christian." Other disgruntled Presbyterians followed. They worshipped and worked together and called themselves "Christians," nothing more. Eventually, the "Disciples" led by the Campbells and the "Christians" led by Stone found each other and united. Bound by a common goal for unity, the two groups puzzled over a common name by which to be known. No official decision was made, but congregations called themselves "Christian Churches" or "Churches of Christ." Despite the ambiguity, the movement grew rapidly. By the 1870s there were more than a million members in the United States. Around the turn of the century, a terrible irony occurred. This fast-growing movement, bound by the common goal to unite the Church split in two, and the movement to heal divisions divided! The issue that launched the fatal fight was the introduction of an organ to provide music in the worship service. It seemed like a small issue to split people with so large a vision. To one group, it was a matter of principle, as there is no mention of instrumental music in early Christian worship. This group considered this type of music to be without authority and, therefore, a sin. The other group pointed to the multitude of examples of instrumental music in the Old Testament, and held that the New Testament was not a legal document and that anything that aided in the worship of God was appropriate. The issue was not resolved, and in 1906, the U.S. Census officially listed a new category of churches calling themselves "Church of Christ." To this day, the Church of Christ does not use instrumental music in worship. During the first half of the 20th century, the group that accepted instrumental music in the worship service, "the Christian Church," had other issues to dispute. Many felt the need for organization beyond the local congregation, on a regional and national level. They felt that this broader organization would more effectively coordinate the work of the church and fill the need for a Christian Missionary Society. Others felt that such organization would turn the movement into another denomination, adding division in the Church. They argued that each congregation should send to its own missionaries. They feared a loss of control over the work of their churches. This disagreement, sadly, led to another split. The separating churches continued to call themselves "Christian Churches," and desired independence from any "organized" church. In 1968, in an effort to end the confusion associated with the use of the name "Christian Church," the group employing both instrumental music in worship and a national organization for missions work adopted an official name: "The Christian Church (Disciples of Christ)". "(Disciples of Christ)" in parenthesis distinguishes the group from the independent "Christian Churches" and also points back to the historical usage of "Disciples of Christ." Visit the official web site of "The Christian Church (Disciples of Christ) here.